This month, NEC has introduced its first 2018 LaVie notebook: The LaVie Note Mobile. The LaVie line is known due to its design philosophy of being lightweight: when we had a chance to hold the LaVie Z back in 2015, it was so light it felt like picking up an empty shell of a system. For 2018, the Lavie Note Mobile is the newest member of the family, being updated from the previous model. 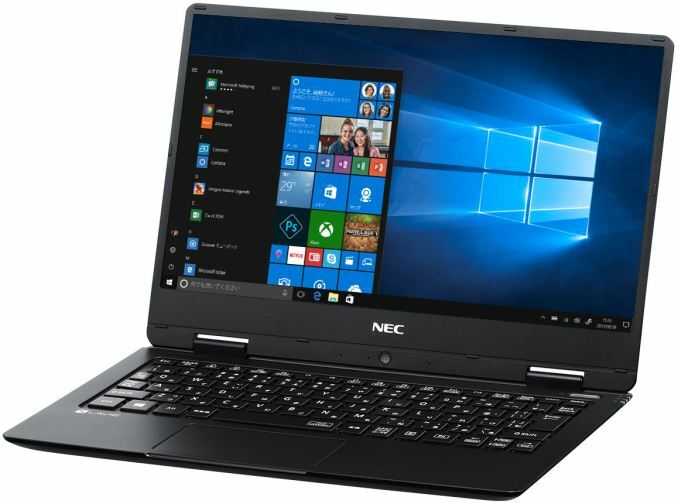 This design has a 12.5-inch screen, and since Intel has not released any new ultra-low-voltage CPUs recently, NEC had to retain usage of Kaby Lake-Y SoCs. Despite featuring a larger LCD, the new 2018 Lavie Note Mobile still weighs in the range of two pounds (~900 grams) and is rated to work for nearly 12 hours on one battery charge. 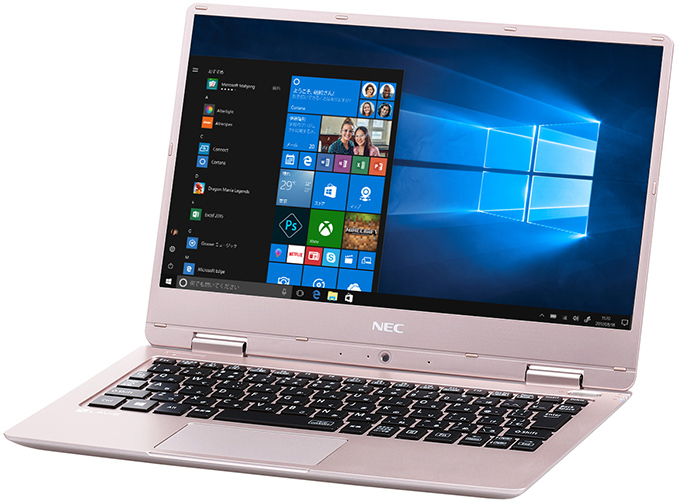 NEC’s Lavie Note Mobile is the company’s most compact laptop lineup. The previous-gen Lavie Note Mobile came with 11.6” IGZO IPS FHD displays, but for the 2018 (NMx50/KA) family NEC decided to update it in three ways: an 12.5” IPS FHD monitor, reduce the system’s thickness to 17 mm, and increase the amount of DRAM on high-end models. The LCD gained nearly an inch of real estate, but lost its IGZO material in the process. Compared with the 2017 model, it is worth noting that the updates cause a couple of minor changes: the 11.7-hour rated battery life is slightly down from 13, and the weight is slightly up by a few grams. The increase of the display size, reduced thickness and enhanced RAM size will make the new Lavie Note Mobile more competitive against ultra-compact products like Apple’s MacBook, so NEC’s design decisions look rather logical. As for visual aesthetics, NEC also adjusted its Lavie Note Mobile lineup this year: the new notebooks will be available in pink, pearl white and pearl black. Overall other specifications of the 2018 NEC Lavie Note Mobile range are similar to the 2017 versions: at retail, available systems are based on Intel’s Kaby Lake-Y SoCs: the Core i5-7Y54, the Core m3-7Y30 or the Celeron 3965Y. In order to get the Core i7-7Y75 model, according to PC Watch, the unit has to be bought directly from NEC. The Kaby Lake-Y SoCs feature two cores, Intel’s UHD Graphics 615, and are around 4.5 W rated TDP, which is of course their main feature that enables NEC to use passive cooling. The new Lavie Note Mobile machines are equipped with 4 or 8 GB of dual-channel LPDDR3 memory (up from 4 GB on previous-generation Lavie NM laptops), as well as a Samsung PM871b SATA SSD featuring 64 GB, 128 GB or 256 GB capacity. The higher-end Core i7-based SKU also has a 512 GB PCIe SSD option. When it comes to connectivity and I/O interfaces, everything looks pretty standard: the NEC Lavie Note Mobile laptops are equipped with a 802.11ac + Bluetooth 4.1 wireless module, two USB 3.0 Type-A ports, a 3.5-mm TRRS audio connector, a Windows Hello-compatible fingerprint reader, an HDMI output, a webcam located under the display, a built-in microphone, stereo speakers, an SD card reader and so on. All the physical ports are located on the backside of the notebook. Some might consider the lack of a USB Type-C port in 2018 a drawback. A sharp-eyed reader might also notice a rather small space bar that is barely six centimeters long. While this looks like a problem for people using European languages, this is not a problem for Japanese, who do not have to use spaces often, which is why short spacebars are common on laptops for the Land of the Rising Sun. NEC’s Lavie Note Mobile is already available. The most affordable Celeron-based model costs ¥104,800 ($963), whereas the more advanced Core i5-powered SKU is priced at ¥144,800 ($1330).